You don't seem to realize it's Saturday. Because if you did, you wouldn't be so cruel as to continue putting a damper on things. It's been raining for three days. And it's starting to ruin Grandma J's whole life day. It's wet and cold. Don't tell anyone but no one is getting dressed. It's gonna be a PJ and hot chocolate kind of day. As Grandma J hunkers down right here and watches some football. How is Mother Nature treating you? 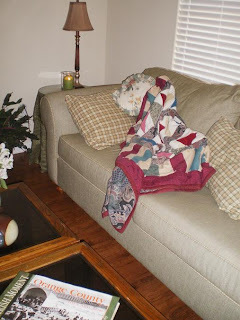 Your couch looks like a great place to hunker down!!! We are dry. We are hot. We are dry, hot and humid. I was outside getting chores done, and sweating like a piggie. Grandma J. - You are not alone. There are people here on the East Coast in a funk walking their dogs in bathrobes wondering why they should ever bother to get up at all. This is on a good day with the sun shining. 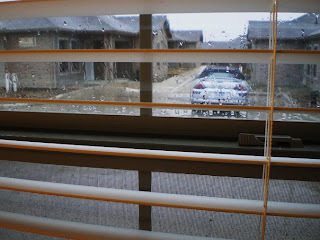 If it's rainy and dreary outside, as best as I can tell there's no Earthly reason to do anything except sleep. Until summer gets here. It is still cold and still winter here. The snow and ice has finally melted mostly off of the roads, but we still have plenty in the yard. It finally made it to just above freezing yesterday, so we went for a walk. I'm still trying to thaw out my fingers and toes after that. That couch looks better every day! It has been decent around here. We are beginning to need rain. We had lots of snow, but it wasn't very wet, so this spring and summer, the farmers are going to gripe.....again? still? We're getting it today. Gonna sit in my sweats, with my antibiotics, tissues, inhalers and dog. And cheer for the Jets! Because our Giants let us down. So, GO JETS! Yesterday was MY pj's and tea day! We both had the same idea I guess---but then last night we had to take the beasts to the dog park or there would have been no rest. You should join Friday Foto---Jen did, then I did too. It's a small group like our A-Z was. 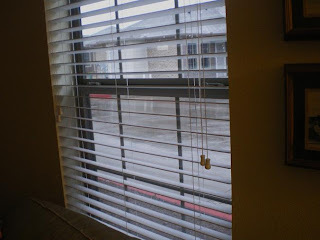 It''s "Rain, Rain, Go Away," here too....good thing I have tomorrow off....I can stay inside and clean this place...it's been neglected. I see sunshine! It's about time! I am so not a winter person.